Do you love historical fiction, knights in armor and romance? How about a tale with all of these set in future North America? Escape to a passionate world of danger, love, war and redemption -- the world of Stonegate. But tales still tell of marvels from long ago-flying machines and devices run by the power of lightning. Now grass grows in the streets and rusted hulks are all that remain of the proud machines. A new time of troubles now threatens. The free towns of the rugged mountains and plains are in the path of conquest. The Prophet's armies are coming, filled with hatred and armed with terrible, rediscovered weapons. Donald of Fisher, outcast and alone, is in the path of the march, searching for Rachel, who has been captured by the Raiders-minions of the Prophet. But how can he find and rescue one small captive in a wilderness teeming with enemies? And even if he succeeds, should he wield his sword beside the tiny band of defenders? Is Donald to become yet another victim, or is he, just possibly, the deliverer promised in prophecy? What can one person do in the face of a war that will shape the future of a continent? 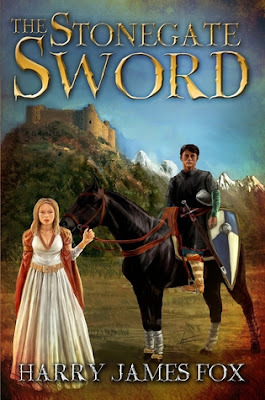 The Stonegate Sword would not be my typical reading choice but the blurb grabbed my attention and I thought I would try something new and I'm glad I did. The story is set in the future where civilisation has reverted to a more medieval setting in relation to technology and a feudal society. There is a subtle Christian theme running through the story. But it is essentially a coming of age story as Donald, a young man more accustomed to book learning, is thrust upon a battle strewn path in search of his beloved Rachel. Donald has one adventure after another and goes through many ups and downs in his quest to rescue Rachel. The pace is quite gentle and I found myself relaxing into the story rather than reading it at breakneck speed. I enjoyed reading the vivid descriptions of the natural landscape. The battle scenes were particularly well written and engrossing. I was intrigued by the notion that civilisation has lost all its advancements in technology and are relying on what can be learned from surviving texts. It provokes the reader to think about how this came about and how people would survive a catastrophe of this sort. Unfortunately for women in this new age they seem to have lost their voice; having no more status than being a man's wife, daughter, something to fight over or rescue. With the lack of religious institutions to keep women down I'm not sure this would be a realistic development. I would have liked to see some female characters taking a leading role in society and being a force to reckon with in their own right. The Stonegate Sword is well worth a read and I recommend it to anyone who likes a good adventure story.